Salewa’s new Ultra Train is their first foray into traditional trail running shoes. The Ultra Train is a neutral, 8mm drop off-road shoe with a supportive upper and durable, grippy Michelin outsole. Despite the level of protection and stability that this shoe offeres it is still pretty darn lightweight, coming in at only 10.1 ounces in a men’s size 9. While many may find that this shoe is perfect as a lightweight hiker it is definitely more than nimble enough to run in. The ultra train is relatively torsionaly rigid and has a very supportive upper, which gives it quite a bit of stability for those of us who over-pronate. Salewa uses a proprietary 3F system on their shoes and boots, including the Ultra Train. The system is comprised of a firm bar underneath the arch that connects to the heel collar, throat and lace holes. The Ultra Train shines when it comes to protection, which makes it a great option for a lighter weight hiker. The full-coverage blown rubber outsole is made with durable multi-compound Michelin rubber with no exposed EVA foam. The 3F strap under the arch also provides some lateral rigidity and protection. The stitched fabric overlays on the Ultra Train’s upper wrap the foot in a protective shell, and the dual-layer front bumper effectively shields runners’ toes from errant rocks and roots. Although the mesh sections are stretchy, the weave is tight enough to prevent most dust intrusion, and the full-length tongue gussets help with this. 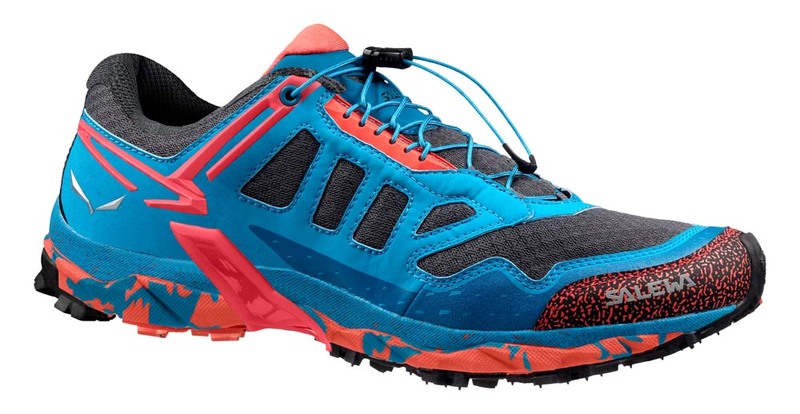 With shoes such as this, Salewa proves themselves to be a promising newcomer in the trail running category.